← Cathy’s Corn and Black Bean Salsa — Yum! This was a great way to see Cleveland. It was a bonus to be piloted by Rand, an acquaintance of ours from Oshkosh. 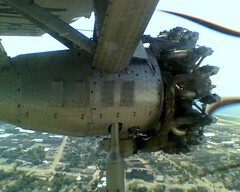 This entry was posted in Uncategorized and tagged EAA, Ford Tri-motor, Rand Siegfried, Tin Goose. Bookmark the permalink.